Faulty wiring and outlets are one of the top causes of house fires. Home > Blog > Faulty wiring and outlets are one of the top causes of house fires. Using our claim data, we've developed a list of the most common causes of fire-related losses as well as some things you can do to help prevent them. Be aware of the capacity of your home's electrical system. Don't overload your outlets. If you have questions about your home's electrical system, you may want to consult a licensed electrician. Understand the difference between surge protectors and power strips - both allow you to plug in multiple electronic devices, but only the surge protector will help guard these devices from a power spike. Use surge protectors to protect valuable appliances, such as computers and televisions. 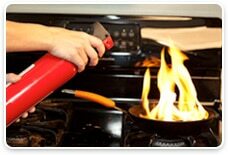 Carelessness in the kitchen may also lead to a house fire. If a grease fire erupts, turn off the heat source. Don't throw water on the fire because it may cause the fire to spread. If a fire starts in your oven, close the over door and turn off the heat to smother the flames. If a fire starts in your microwave, turn off the microwave, and don't open it until the fire is completely out. Unplug the microwave only if you can safely do so. Clothes dryers are another common source of house fires. If you're installing your own dryer vent, follow the directions in the manual. If you're unsure about how to properly install the vent, consider hiring a professional to do the installation. Lint may also collect under and behind your dryer, so don't forget to clean these areas. Alternative heating sources may also create a fire hazard. Avoid using an older space heater, if possible. When purchasing a new space heater, pay attention to the safety features. Don't place a space heater near furniture, curtains or other objects that could easily catch fire. If you plan to install an alternative heating system, such as a wood or pellet stove, follow the instructions. If you're unsure about how to properly install the system, consider hiring a professional to do the installation. Dirty chimneys also pose a fire hazard. Have your chimney inspected annually by a CSIA-certified chimney sweep. Have a professional clean and repair the chimney as needed, especially before the cold months, when you'll be using it frequently. Never burn cardboard boxes, wrapping paper, trash or trees in your fireplace - these can all spark chimney fires. This comes from Travelers. If you have any questions about your home insurance, please contact us.